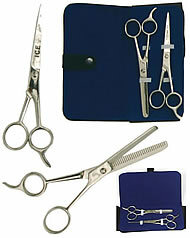 5" Ice Scissor with finger rest, 5" single blade Thinning Scissor and a snap foldover Velvet Case. The case is black outside and blue blue inside. Two side flaps fold over shears.